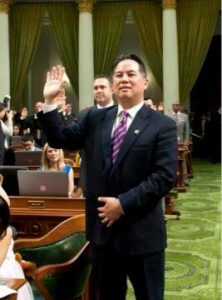 SACRAMENTO — On his first day in office representing the 19th Assembly District, Assemblymember Phil Ting (D–San Francisco) was chosen as Democratic Caucus chair, one of the top leadership positions in the Assembly. The caucus chair is part of the speaker of the Assembly’s leadership team, working to help pass legislation and to assist other members in their duties. Ting said he was honored that Speaker of the Assembly John Pérez asked him to join the team. “I’ve known the speaker since we attended UC Berkeley together, and my long-standing friendship with him makes it an even greater honor to serve alongside him in leadership,” said Ting. Ting is part of the largest incoming class of freshman members of the Assembly since 1966, with 39 new members out of the 80-member Assembly. Ting, previously assessor-recorder of San Francisco, called the leadership position a chance to do more for the people of the 19th Assembly District. “I was sent to Sacramento to work for high-wage jobs, high-quality schools and transparent and responsive government. This leadership role will give me even more opportunity to fight for those priorities,” he said.